You are currently browsing the trialbyfiregames blog archives for February, 2011. 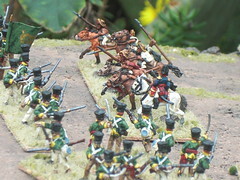 Finishing first batch of miniatures for the Battle of Laguna Salada. Here are some samples. I took the pictures in my backyard as I have heard that natural lighting is supposed to be the best. I like the results quite a bit! This first picture shows a company of Venezuelan Llanero Lancers charging a line of the Cundinamarca Light Infantry of the Irish Legion. 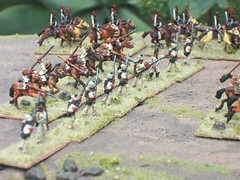 The next picture shows a Royalist Cazadore company (in white) with two companies of Royalist Militia Dragoons to their left. They are backed up by another company of Llaneros (perhaps their lances are prodding them forward?). 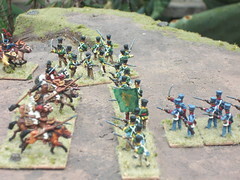 From another angle, the Cundinamarca battalion has one company in square to face off against the Dragoons, while the second company faces the Llaneros in Line, supported by a column of the British Legion in their distinctive blue uniforms. This last picture shows the Cazadores from the front. I really like the NCO and Officer figures created by Grenadier Productions. They are well animated with a nice variety of poses. I had at least four officers in bicornes to choose from, and as many NCOs with muskets directing fire. 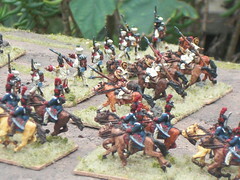 And now that I have the Llanero figures painted, I think they are the best in the line. Reminded me of old Freikorps figures which were the first I ever remember seeing way back in the 80’s to mold the rider and the horse as one piece. I mean the first to do it well, of course. There was the Heritage Napoleonic line that preceded Freikorps’, but those minis don’t stand the test of time, sadly. Stay tuned for part 2 of this project as more figures are flocked for action!